Protestors in Nigeria have marked 500 days in detention of Sheikh Ibrahim el-Zakzaky and his wife Zeenah with a peaceful demonstration in the capital Abuja. 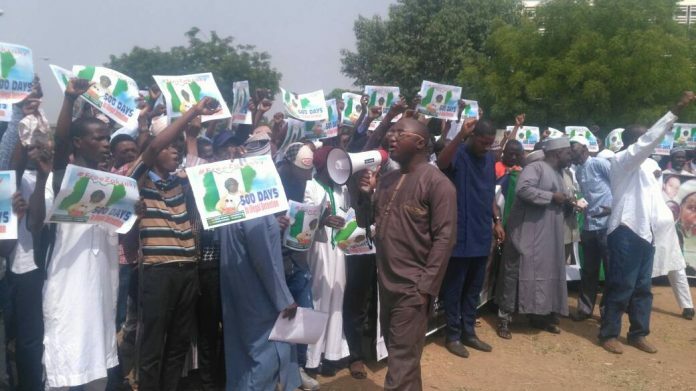 Thousands of demonstrators marched from the Unity Fountain in central Abuja demanding that the government respect the rights to the person, liberty and fair trial afforded to every individual by the Nigerian constitution. The Zakzakys have been held without charge and mainly incommunicado following their arrest during a savage military assault against the Islamic Movement of Nigeria (IMN) in December 2015. Both were shot during the attack in Zaria in which at least 1000 IMN supporters, including three sons of the couple, were killed and many properties and religious spaces belonging to the IMN and its followers destroyed. Although Nigeria’s High Court ordered the release of the pair on 2 December 2016 after a period of detention of almost a year the order has yet to be implemented.